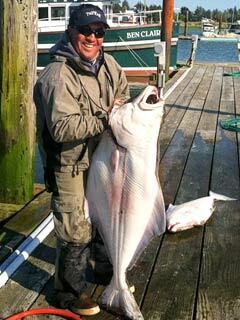 Deep dropping for halibut off of the Oregon Coast is a time honored tradition during early May and on into late summer. The cold waters off of the mouth of the Columbia River along with the abundance of structure and forage fish create an amazing halibut fishery that is pursued by the west's best captains. Mike loves seeing his customers braced at the rail hooked into barn door size Flatties! When a jumbo size 80+ pound fish is brought to the surface, the captain is ready to harpoon your catch in order to make sure it doesn't throw the hook and to ensure a safe landing. We fish for Halibut in waters that range from 200 to 1200 feet deep and we are one of the only charter boats out of the mouth of the Columbia River that have electric reels available for our clients. Electric reels don't take away from the anglers ability to have a one on one battle with our big halibut; but they do make it faster and easier to do bait checks and to bring the gear up from the bottom in a hurry in order to quickly get the boat in gear to do another pass through the prime holding water. Oregon anglers are allowed one halibut (no minimum or maximum size) per day. Filleting and vacuum packaging services are available upon request.